Profitless IPOs are all the rage. Bubble alert? Ghosts of the late 1990s are back, and it's not just Cory and Topanga from "Boy Meets World." In a move reminiscent of the dotcom bubble, more and more companies are going public before they make a dime. 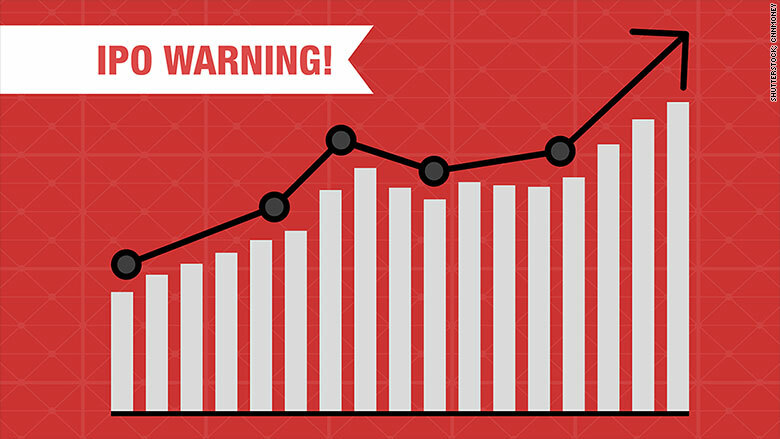 "It's a warning sign for the IPO market," says Jay Ritter, a business professor at the University of Florida, who tracks IPO data. 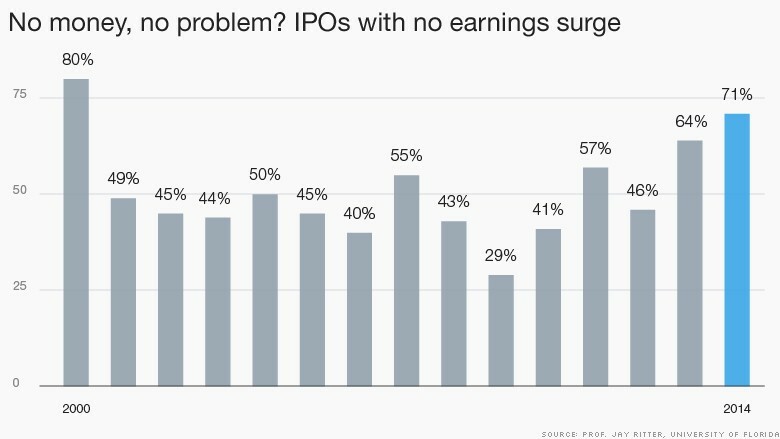 Ritter found that 71% of companies that had an IPO last year were unprofitable. That's a big jump from recent years. As recently as 2012, only 46% of companies that went public didn't make any money. The market hasn't been this hungry for rookie companies since 2000 -- the year the dotcom bubble burst -- when 80% of companies doing IPOs had no profits. Back then it was all about tech companies: the Pets.com's and Broadcast.com's that were rushing to the stock market in their infancy. Investors threw money at almost anything tech related and got burned because of it. The story is different today. Only about a quarter of IPOs last year were tech companies. Instead biotech companies, which create pharmaceutical drugs, are the lead drivers of the moneyless IPO race. "With biotech, people are gambling on a blockbuster drug, even though they know that most will never develop one," explains Ritter. Investors may not care that some biotech are unprofitable because they are in it for the long run and don't mind the short-term losses. But it's tricky to predict the winners in this industry where so many drugs fail and much depends on regulatory approval. Related: Coming in 2015: Uber and Airbnb IPOs? "These are dangerous, they are outrageous valuations for these companies," says David Menlow, president of IPOfinancial.com. "At some point, the market is going to correct that." Drugged up valuations: Biotech companies are more at risk for "a major hair cut" in IPO valuations this year than tech ones, Menlow says. There were 74 biotech IPOs last year, the most in history. Meanwhile, only 53 tech companies went public last year, down 80% from the end of the tech bubble. Tech startups now have more incentive to be bought out by a bigger company, like Google (GOOG), or seek venture capital funding, than go public, Ritter says. Still, IPO prices are huge for some tech companies. Many were surprised at the popularity of GoPro's IPO in June that raised about $425 million, and Alibaba (BABA) had the highest IPO ever ($25 billion) when it went public in September. The bloated pricetags of some biotech and tech IPOs may not be sustainable, experts caution. 2014 was the best year for IPOs since (you guessed it) the tech boom. IPOs raised $84 billion, the most money generated since 2000, according to Pricewaterhouse Coopers. Despite the warning signs on tech and biotech IPOs, the overall market is not in danger like the dotcom era, experts say. The IPO surge is more reflective of the soaring stock market, which had a great year in 2014. Even if there's a correction in some IPO prices, the craze for more company debuts is unlikely to slow much. But don't expect another Alibaba. "I'm not convinced that we're going to be getting these gargantuan offerings," Menlow says.